Stunning blooms, fragrance and butterflies; this plant has it all! Buddleia ‘Royal Red’ sports huge deep purple-red flower clusters that offer up a rich fragrance in summer. 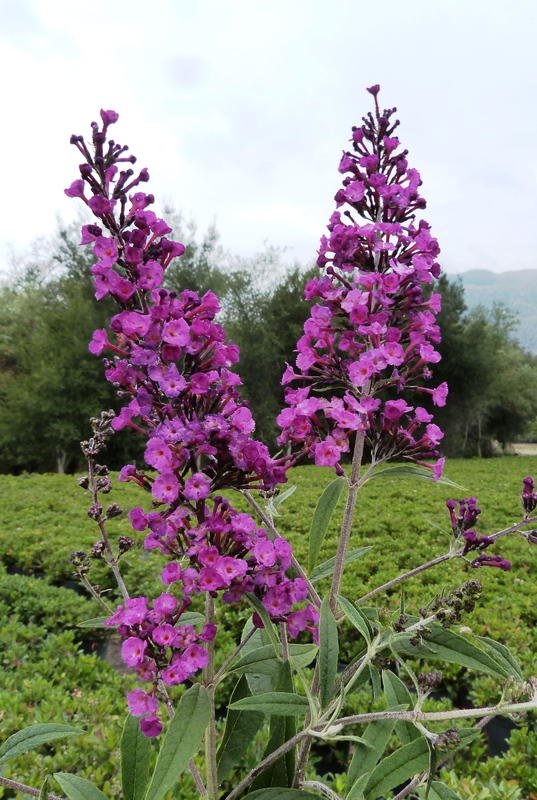 This variety of butterfly bush in particular is very vigorous and heavy blooming. If you’re looking for a buddleia that works in smaller urban spaces, ‘Royal Red’ fits in nicely with its compact and upright growth habit. As with all Buddleia, ‘Royal Red’ should be planted in a full sun location in well-amended, loose soil. One thing butterfly bush will not tolerate is water-logged soil or excess irrigation. Plants are somewhat drought tolerant once established, but will still need supplemental irrigation during dry periods. Just make sure not to overwater. ‘Royal Red’ love the heat and plants burst into bloom as soon the intense summer heat sets in. The 12-inch flower panicles are irresistible to butterflies, hummingbirds and bees. Butterfly bush is deciduous, meaning it will drop its foliage in winter. In northern climates, plants typically die back to the ground. Plants are very slow to emerge the following spring, so don’t worry if you don’t see new leaf buds emerging until late-spring.